The Protector Set offers a selection of handpicked items to help you prolong and the life of your bedding. Brought together at a discounted price it includes 2 Pillowcases, 2 Pillow Protectors, a Fitted Bed Sheet and a Mattress Protector. Our pillowcases, pillow protectors and mattress protector are constructed from high quality materials, designed to defend against dust, stains, rips and more. Whilst our fitted sheet is elasticated, to ensure it doesn’t move. 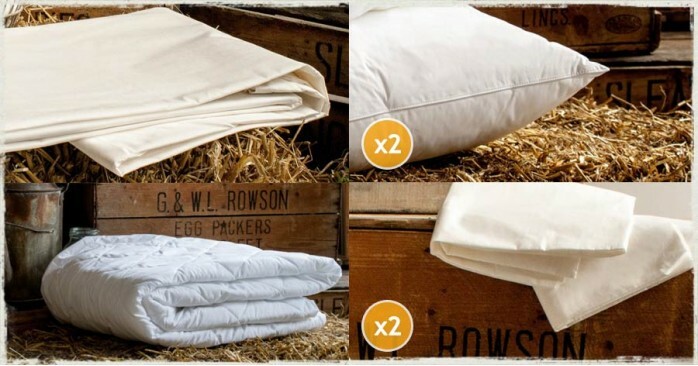 Our 100% cotton, 200 thread count pillowcases are the perfect accompaniment to support the longevity of your pillows. The soft texture of the pillow cases really makes a difference to the comfort of the pillows themselves. These pillowcases are well suited to accompany the Pinsonic Pillow Protector, adding another protective layer to your pillows. Our Fitted Mattress Sheet has elasticated corners designed to prevent movement and creasing. Fitted mattress sheets are particularly helpful if you’re after a bedsheet that isn’t easily dislodged, not to mention they’re extremely simple to put on. It’s 100% cotton and shares the same 200 thread count as the pillowcases offered in this exclusive product set. A mattress protector encompasses a mattress, providing it with an additional layer of protection against stains, moisture, rips, spillages and more. The mattress protector adds an extra quilted layer to your mattress. It’s soft, and provides an additional layer of comfort to your mattress.